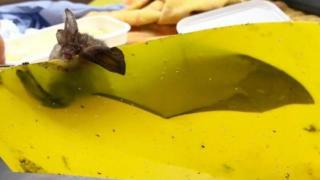 A tiny bat that got stuck on fly paper was rescued thanks to cotton buds and a tub of spreadable butter. The brown long-eared bat, which weighed just nine grams, was found stressed, stuck and “sore” after flying face first into the sticky trap. 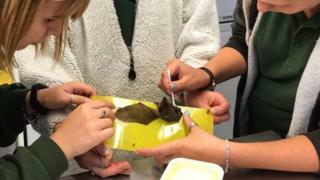 Staff at Wiltshire’s Oak and Furrows Wildlife Rescue Centre managed to “painstakingly” release the bat using cotton buds covered in butter. 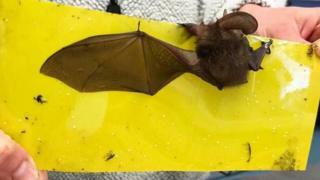 The 3in (7.6cm) long bat was found “completely stuck” to the sticky fly trap hanging in an outbuilding on a private estate in Wiltshire. “He’d flown straight into it – face first – with his wings outstretched,” said Ms Ostler. Using butter and cotton buds, animal carers at the centre in Cricklade spent “many painstaking hours” removing the tiny “biting” creature from the trap. “They’re so delicate and he was stuck on so hard we weren’t sure we could get him off successfully,” said Ms Ostler. Nicknamed Gluey, the bat has now been released close to where he was found. “We didn’t think he had much chance of surviving,” a spokesman for the centre said.